If you have a lot of different passes in your Katana script it can become a bit draining to constantly switch your view flag. The separate Viewer Node in Nuke for example makes it easy to quickly switch between outputs by pressing 1,2,3,…9 as it can accept multiple inputs. 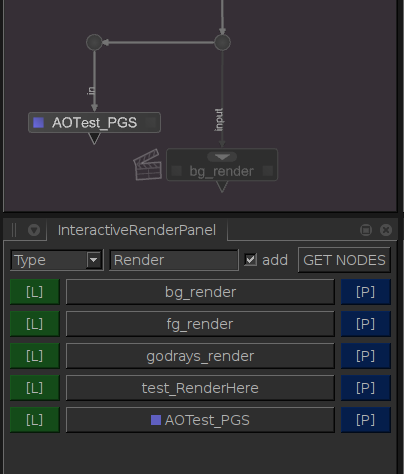 In Katana you have to navigate through your script to the desired node to change the view-flag or launch a render. To add the buttons to the UI you can set it to get nodes by Type, Name or based on your current selection in the Nodegraph. It should be worth noting that the text input is CaseSensitve. If you don’t have the add option checked it will replace your current set of buttons. Katana Interactive RenderPanel from Julius Ihle on Vimeo. If you’re feeling adventurous you can give it a try HERE. To use it put the .pyc file in a sub-directory called Tabs that’s part of your $KATANA_RESOURCES. Anyway, thank you for your blog! I’ve learned a lot. I’ve seen your stuff on vimeo! Super cool! I really hope I’ll find some time to roll your additions into my version as well! Thanks for letting me know!